Okey doke. Stephan Shemilt's report is now ready to view over here, so it's time for me to bid you a fond farewell. Thanks for your input today: you've been good. Let's do it again tomorrow. Night. Michael Petchey: First day honours even I would say, but all depends on how England tackle the tail tomorrow morning. One thing's for sure: England need to get rid of the South Africa tail early on tomorrow. Anything more than 300 is a decent total on this pitch. Jay: Now that SA have to scored enough runs for Stokes to knock off, they'd probably want to add some for the rest of the England batsmen. "It's been a strange day for South Africa, with the wicketkeeper being ruled out and his replacement flying in. How South Africa have played today rather summed it up." England bowling coach Ottis Gibson on Sky Sports: "We struggled early on to find the right length but after that I think Finny bowled really well. As the day went on, we got better and better. We did tail off a little, but to lose the toss and have the opposition seven down at the end of the day is reward for our hard work. "Finny has been outstanding ever since he came into the team in the Ashes. He is going from strength to strength. "Ben Stokes has also improved over the last six months and Moeen continues to chip in. "If I'm South Africa I'm disappointed with that. Amla and Elgar were the only two people who were got out by good balls. Four of them got out to cross-batted shots, and the run-out. They made silly shots and gave it away. "We don't know if it's a good total or not. With no Steyn and no Philander - we don't know how South Africa will go on it; they haven't got the experience, except for Morkel, so we're not sure." "It was a pretty strange day. England didn't bowl very well this morning when there was bounce and carry. Jimmy Anderson was all over the place - he looked very rusty - and Broad wasn't in rhythm. "The ball that Finn got Amla out with was a corker. Stokes bowled well in parts - skidded it around and bowled some good bowls. Moeen did well too." The individual scores recorded by South Africa's top six reads like a list of lottery numbers: 46, 21, 40, 36, 16, 23. The bonus ball? Chris Morris' 26 at number eight. Greg: Good grief I think South Africa have played and missed about 100 times today! Time to recap on what we've just seen. Which is quite a lot. South Africa won the toss and batted first. They looked to be laying solid foundations all day, but consistently lost wickets. The partnerships South Africa recorded tell a story: 44, 73, 10, 34, 24, 27, 13, 42*. Ian Bradley: Win toss, bat, lowest score 16 yet lose 7 wickets, if that's happened before I'll give you the money myself. "I wonder where the South Africans feel they are in this Test - they have played a lot of cricket here. If South Africa get another 50 or 60, I would rather have the runs on the board." I don't know what to make of that. Are England on top, having taken seven wickets after losing the toss? Or are South Africa a few lusty blows from a par score? The Proteas do have a pace attack which may relish steaming in on a green pitch with some widening cracks. A final rendition of Jerusalem is belted out by the England fans, who then applaud themselves. Why not? Chris Morris takes it upon himself to see off the final over of the day, which he does. Just about... the final ball of the day springing off a length and spooking the batsman. Time for some rest now, though. The players head off at the end of a hard-fought day. "You've got to question why England haven't got another catcher or two in at this stage - late in the day, new ball, bowling at the tail." Last over of the day coming up. "I'm amazed there hasn't been a nick to the slip cordon today." Kagiso Rabada could not have had any more luck if he'd walked out to bat with a four-leaf clover. He's going after everything and, more often than not, failing to connect. Ben Stokes can't believe what he's seeing. Mike Abram: Re all batsmen in double figures in Tests: has it ever happened when no one has made 50? James Anderson decides to go round the wicket to the left-handed Kagiso Rabada who has had his fair share of luck in this innings. Lining up England's all-time leading wicket-taker for a baseball-like swat, he is left flashing at fresh air when he is beaten for pace. To rub salt into the wounds, he drives four through mid-off with a lovely flourish. He was bound to get hold of one eventually. Matt Walby: Jolly handy these updates, keeping me going through a 5-hour parents review day at school. Even had a South African parent! Chris Morris takes no prisoners. None at all. Ben Stokes pitches the ball up, it's in the slot and Morris belts it through the covers for four. That would have decapitated a pigeon if one had been unfortunate to be grazing on the grass seeds of a used wicket. He hit the ball so hard. Steven Mitchell: How often have all 11 batsmen in a Test-match innings registered double figures? Could happen here. SportsMind: What's the lowest total where every batsman reached double figures? They say a good motorist should adjust their driving style to the conditions they are faced with. Kagiso Rabada would do well to heed the advice as he time and again goes for the glory shot through the covers, but time and again is made to look silly by a James Anderson outswinger. As the youth of today would say, he's being owned. But he's still there. Much to Anderson's annoyance. "That was a lucky one from Morris - he couldn't have done that if he'd tried." A lucky escape for Morris. Playing back to Finn, the ball skews tamely back over the bowler's head and plops on to the ground where the umpire was stood. English heads in hands. PitchedOutsideLeg: Boy in primary school class had surname of Newball. Often wished he'd become tennis player or cricketer. Could have caused chaos. Steven Finn bowled England's first no-ball of the series in the last over, and was lucky not to be called for another massive overstep. James Anderson is still wicketless and can hardly believe it when he swings two beauties past Kagiso Rabada's groping outside edge. He's too good for the youngster. "This partnership is just developing. It's been the story of the day - South Africa have had many small partnerships but not one that really hurts an opposition team and goes a long way to winning a Test match." Steven Finn has been England's best bowler once again today. Fast, plenty of bounce and some late movement. He's everything you want in a fast bowler. Chris Morris doesn't fancy it. He fends off a short one with one hand off his bat and facing the other way. Finn is the type of bowler who can slice through a lower order like a hot knife through butter. As I type that, however, Kagiso Rabada brings up his side's 250 with a push through the off side for four. A very poor album cover from the nineties? Or just three wilting England fans? "He's got some talent, this Morris lad. He might be what South Africa looking for: someone who can bat and bowl seam. He's also such a good slipper. You're getting a good cricketer." Three slips and a gully are stationed for Jimmy, who finds the outside edge straight away but a sprawling Ben Stokes can't quite get his hands to a difficult chance. Chris Morris then squirts four past backward point. Hang on... four more when Anderson strays down leg. His first loose delivery of the day. He's furious with himself as the ball races off the turf through mid-wicket. New ball time. James Anderson time. Nick Round: I like England's new tactic, let the batsmen get themselves in and then let them get themselves out. Kagiso Rabada is looking unconvincing against Moeen Ali, leaving one which dips back in and almost knocks back the left-hander's off stump. He knows what to do with a full toss though... clouting it for six. Slog. "We still don't know if it's a poor score until England have batted." Nothing to see here. Move along please, gentlemen. "They went straight up for the review. But not a sausage on Snicko. The ball went past the outside edge and the bat is nowhere near the pad." Has Kagiso Rabada feathered behind here? Everyone in the ground thinks not, except Jonny Bairstow who asks for a review. Hashim Amla has spent the evening session supping brews and sporting dark shades. A cool customer on and off the pitch. England encourage each other between deliveries, desperate not to let the day coast to a conclusion. Peter Eastwood: Re 08:25. I'd like to publicly apologise to my mother after this morning, got back from the dogs promptly and have seen all 7 wickets. Moeen Ali is racing through his overs here - making sure England get as close to the 90 as is possible before time is called at 16:00 GMT. James Vince hit 88 to lead England Lions to a comfortable five-wicket win over the United Arab Emirates in their first 50-over warm-up game in Dubai. The Lions, captained by Sam Billings as Vince stood down to allow him leadership experience, overhauled a target of 211 with eight overs to spare. Tom Westley helped seal victory with an unbeaten 57, after Jamie Overton and Liam Dawson claimed two wickets apiece for the tourists. The Lions face the UAE again on Saturday before a five-match one-day series against Pakistan A starts on 20 January. My fellow Lancastrian Phil McNulty (BBC Sport's chief football writer) has been in touch. He's much more optimistic than myself. He reckons England will pile up 500 on this track with Alastair Cook serving up 150. South Africa's bowling attack is a little green without Dale Steyn and Vernon Philander. Maybe he's right? England appeal for another when Stuart Broad beats Kagiso Rabada's outside edge. Close, but no cigar. Email Message: If England can bowl them out for less that 300 I reckon England will have a first-innings lead which will prove decisive. 2-0 on the cards - who predicted that before the first Test? If England can bowl them out for less that 300 I reckon England will have a first-innings lead which will prove decisive. 2-0 on the cards - who predicted that before the first Test? Maiden for Moeenlitharan, as I've heard England's premier spinner is now nicknamed. Let's go with it. Ben Dalton: Every South African player out has made double figures but they're yet to hit 230. Restarting more than my knackered laptop. Let's not kid ourselves, the South Africa pacemen will be handy on this surface. We could be on course for one of those 250-plays-250 matches which come down to a narrow victory for either side. A la Edgbaston 2005. "It's been gifts all afternoon for England. Vilas had done the hard work - and only 5.2 overs remaining before the second new ball. England have got a great chance to get the last three wickets tonight. South Africa are going to be a long way short of the par score of 315." "Moeen took that pretty well. He had to wait a long, long time for that ball to come down, looking up into the sun. Another gift for England." I think we can safely assume England will be batting before the close of play (16:00 GMT). South Africa are folding like a deck of cards - this time Dane Vilas taking on a ball which wasn't short enough to pull and top-edging to Moeen Ali at long leg. A good catch, since the sun was in his eyes. I told you Moeen always wins! (see 66 overs). Dane Vilas looks a well organised player, punching Moeen through the covers for two more. I suppose he had to be organised to get from one end of South Africa to the other in a matter of hours this morning. Ron Elliott: Me & mate Keith Scott, openers for Nepotists CC both got 5-fors vs Tipton St John while on tour. Oppo renamed Tipton St Rabbits. England have got a pogo stick-like spring in their step now. They sense an opportunity to grab the game by the short and curlies. Dane Vilas has a lot to make up for and he drives Stuart Broad through the covers for four. Sweetly timed, and he split the field like a man shelling peas. "I've got England more than just a nose ahead." "England have nudged ahead here - they're definitely the team in ascendancy." Dexter Stapster: A great game of cricket! The way the pitch is playing though... I fear the Morkel. South Africa have lost five wickets for 95 runs. They clearly tucked into the old Collapso Soup at lunch-time. England just stuck with the leek and potato. Solid. James Levy: My phone keeps vibrating when wickets fall, leading to some annoyed stares from management. Until one asked what the score was. Terry Mahoney: James and I have just had a look at live text. I'm his boss, it would be totally unfair if you tell him to get on with his work! "South Africa have missed a massive opportunity; they could easily have been three down today. England will be delighted - they've had the better of the day. They will be thinking, '250 all out - let's have a bat tonight'." "There's no need to take that risk. I don't know why they've gone for that single - he hit it too hard. South Africa keep getting a partnership that looks like it's going to develop." What has happened here? This is calamitous for South Africa and Temba Bavuma. Dane Vilas bangs the ball to mid-on and sets off. Bavuma isn't sure, is late to go and is miles behind in the race against sub fielder Chris Woakes' throw. Jonny Bairstow does well to dive and break the stumps in one motion, leaving Bavuma well short. In fairness, there probably wasn't a single there. Vilas got in, but he forgot about the well-being of his mate. "The problem for South Africa is that four of the batsmen have got in without going on. If you're going to make really good totals, someone in the top six has to make a hundred." Dane Vilas tries, once again, to get hold of Moeen Ali but he instead mis-cues through square leg for four. Email Message: With James Taylor at short leg and Steven Finn able to field at long leg could England have potentially the shortest legged short leg and longest legged long leg in Test cricket? With James Taylor at short leg and Steven Finn able to field at long leg could England have potentially the shortest legged short leg and longest legged long leg in Test cricket? Stuart Broad is back for a bowl having spent some time off the field suffering from a stomach bug. He doesn't take any time to slip into his groove though, managing to get one to rear up off a length and hit Temba Bavuma on the gloves. Just a treble of singles in the over. 200 up. "Vilas looks like a typical keeper - busy. He's running hard and he danced to hit Moeen over his head." Good running from Dane Vilas, who sneaks a single to mid-off. "One team used four official wicketkeepers in a series: India in 1952-53 against Pakistan." Temba Bavuma would be a good name for a real ale. You'd definitely be happy with a pint of Temba if it was on tap. The early fizz in Bavuma's game has gone and he's beaten by one which keeps low from Steven Finn. He does, however, help himself to four when Finn serves up one on his hips. Jswizzle: Remember when everyone said Finn wasn't good enough a few years ago? He's been the game changer recently. What is it with all these Danes and Dales in South African cricket? It's like all the Mitchells in Australian cricket. Dane Vilas comes into this game on the back of an unbeaten double century in domestic cricket. He shows his confidence by whacking Moeen Ali back over his head for four. I've lost count of the amount of times a batsman has done this to Moeen and been sent packing two or three overs later. Moeen generally wins the fight, if not the initial skirmish. Email Message: When is the last time that none of our first five wickets in a match (or innings) came from Broad or Anderson? Looking good for the next generation! When is the last time that none of our first five wickets in a match (or innings) came from Broad or Anderson? Looking good for the next generation! I see a few of you noticed my deliberate mistake before... typing Finn instead of Du Plessis. Good to see you're on the ball. England are applying the squeeze now. They've got the door ajar, and they're primed to kick it off its hinges. Six dots from Steven Finn. "Dane Vilas has had an incredible day. Thank goodness he answered his phone this morning. Now he's walking out to bat in a Test match and South Africa need him." Steven Finn is a big, mean fast bowler with the ball in hand, but he spends his time between overs obliging with a few autographs on the boundary. Good to see. The new man at the crease, by the way, is Dane Vilas. The man who was flown in from Port Elizabeth this morning after Quinton de Kock woke up in the middle of the night with an injury. Just one from Ben Stokes' latest over. "He just tried to flick it. Hales had to move back and the sun was in his eyes. It was a good catch. Du Plessis threw his hands at a ball down the leg side and it sailed to the man on the boundary." "It was an absolute dolly, straight down backward square leg's throat." You know when you're playing backyard cricket and you keep your little brother interested by lobbing up a simple catch? Well, Faf du Plessis has just done that - he can barely believe he's clipped such a simple chance to Alex Hales at backward square. "The only wicketkeeper to be involved in the dismissal of the first five batsmen in an innings is Brad Haddin for Australia against India at Brisbane in 2014." There's a flourish about Temba Bavuma. He uses surgical-like precision to guide Ben Stokes through the off side for four. A rank delivery from the bowler, mind. Alastair Cook, standing in the slips, chews gum and has a natter with Jonny Bairstow. We're at a crucial time in the innings: England don't want to be sucker-punched by a counter-attack now. "The game is nicely balanced at the moment. South Africa will hoping for 300, maybe 320. The surface has a bit in it and England have been a lot better since lunch." We're asking for your greatest achievements with your best mates from school, in honour of Faf du Plessis and AB de Villiers: #bbccricket on Twitter,81111 on the text or email tms@bbc.co.uk. Martin J McGuigan: Me & my mate shared all 9 goals in 9-0 win with me scoring 5. He was the local hero - newspaper said "Holdcroft scores 4". Tema Bavuma is having his technique examined by Professor Anderson, who shapes one back in and finds the inside edge. Unfortunately for the master bowler, the ball runs for a single. When he gets Faf du Plessis on strike, he bowls the perfect outswinger. Skills. "I don't think we'll get any interruption from the weather tonight, it looks lovely. We're set for an evening's cricket." I'm not sure there's a single person who Ben Stokes is friendly with when he's bowling. He's grumpier than a constipated crocodile as he curses his own fielders, the batsmen and even glares at the umpire. His mood isn't help by being worked for three through mid-wicket by Faf du Plessis. He digs in a bouncer to Temba Bavuma, who goes after it and pulls it round the corner for a single. Bhavin Shah: Excitement when phone beeps making me think a wicket has fallen. Disappointment when you realise it's a family whatsapp message. There are parties breaking out all over the ground. Some dance to the tune of a brass band, others sip drinking the local brew in a paddling pool. Faf du Plessis is having his own party... getting hold of a James Anderson half-tracker and heaving it for four into the empty leg side. 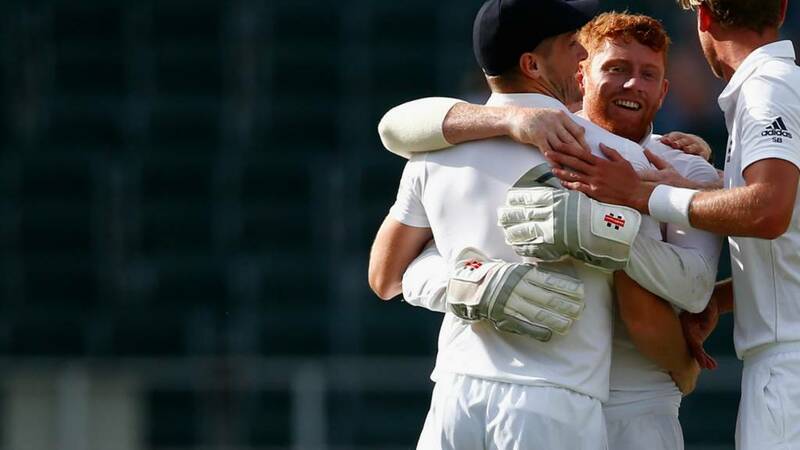 "Jonny Bairstow is only the second England wicketkeeper to catch the first four batsmen in an innings - after Jack Russell against Australia in Melbourne in 1990." Rob: AB de Villiers done by overconfidence rather than excellent bowling. The average score for the first innings here is around 320. South Africa are a long way from that at the moment - especially with Hashim Amla and AB de Villiers back in the shed. Ben Stokes is running in hard, scowling as he passes the umpire on the way back to his mark. Especially when Temba Bavuma puts his front forward and drives four through mid-off. Sumptuous. Fenners: So nice to see 161-4 in a Test match rather than 300-1. Nothing better to bring the supporters back. Temba Bavuma is a very impressive young cricketer and he gets off the mark with a nice drive for three off James Anderson. Chris Herd: Me and my mate just won a cracking hand of bridge. "Look at the height. Just above shoulder. Once you get it that high, you can't pull any more - it's a hook. It's awkward." The BBC live text cricket team are in agreement that this is the best contest between bat and ball we've had from a pitch in the last couple of years. Everyone's a winner. Temba Bavuma is the new man at the crease. "Wickets can come in clusters here. There's just enough to interest the bowlers. I'd like to bowl on this, rather than the flat thing at Cape Town." "It was a little paddley hook shot, trying to run it to fine leg. It's just flicked the glove. Stokes has done it again." A huge, monstrous wicket for England. Ben Stokes digs one in, AB can't resist a dabble at the hook shot and ends up grunting in annoyance as the ball clips his glove on the way through to the keeper. That's two wickets for Stokes now, and four catches for Jonny Bairstow. "It's a wonderful shot. He's just got such confidence in his ability." Moeen kicks us off after lunch. A gentle, placid beginning is swiftly ended when AB de Villiers waltzes down the track and belts a maximum over cow corner. He's actually hit the ball out of the ground. The match referee is sent out with some replacement cherries. Faf du Plessis slips on his sweatband and helmet and marches out to the middle behind AB de Villiers. Did you know these two are best mates from their school days? I like the idea of two youngsters one day conquering the world. What's the best thing you've done with your childhood friend? Climbed a mountain? Routed the Dog and Duck for 12 all out? Josh Roberts: Leaving my current job next Wednesday + TMS on the not-so-sly = zero working getting done! Jay: People sending pics of their monitors with live text on need to learn the fine art of following BBC cricket in stealth mode. Afternoon all, Marc Higginson here - checking back in for the final session of the day. Ray Allger: If England can take 2 or 3 wickets in the evening session you'd probably say it was their day. "Cricket South Africa is still in discussions with a number of players. My understanding is that if they are charged, the majority will be charged with not reporting information." "England were very good in that session. They started well - Anderson and Broad set the tone - but South Africa look like they're getting themselves into a decent position." "The first session was hard-fought. Ditto the second session." The bails removed, a handshake between the batsmen, the players heading off for brew. A good session, that. England better with the ball, the day pretty much in the balance. Former South Africa all-rounder Gulam Bodi has been charged by the International Cricket Council with attempting to fix matches. It was reported last month that an intermediary had been charged, but Cricket South Africa has today revealed Bodi's identity. A CSA statement said Bodi has been charged with "contriving to fix, or otherwise improperly influence aspects" of the Ram Slam T20, South Africa's domestic Twenty20 competition. The 37-year-old, who played two one-day internationals and a T20 for South Africa in 2007, has been suspended. Moeen has in fact switched ends, replacing Finn and still bowling round the wicket to right-hander De Villiers. Plenty of men on the leg side, ABDV still gets a single. This is better to Du Plessis, back over the wicket, looking to turn the ball into the stumps. Du Plessis, though, drives for four. Maybe only one over left before tea. "James Anderson is a wily old fox. He knows how to stay in the game by keeping things tight and then, before you know it, he's taken two wickets and ends the day with figures of 2-45." Alastair Cook finally withdraws Moeen in place of James Anderson, who has a packed cordon for former Lancashire team-mate Faf du Plessis. Off-stump line, a touch wide, really. Du Plessis leaves alone a maiden. "AB De Villiers scored that 30-odd ball century in an ODI here, and he's walked to the middle with a spring in his step today. He's scoring at a run a ball and he clearly likes batting here." Ooofff. De Villiers fights fire with fire, taking on the previously unplayable Finn with a belting cut shot that thuds into the boundary board with a rapier thrust. Not quite the menace in that over from Finn. "Looking at the way Finn has bowled, Morne Morkel will be a handful on here." Still Moeen. Any chance of some pace, captain? Du Plessis, who I think may have been given a gob full by Finn at the end of the previous over, chews his gum and defends from the crease. It looks much more preferable to be facing Moeen than Finn at the moment. "What an over that was from Steven Finn. He was too good for Faf du Plessis. As a batsman, you are just relieved that you're still out there." "Goodness me, how is Du Plessis still there?" Steven Finn really has been England's most potent threat in this series and produces another rozzer to leave Du Plessis groping like a man looking for his keys in a darkened room. Angle, pitch, nip away. And again! How has that missed? Someone check that the gap between the stumps isn't big enough to fit the ball through. Beth Jakubowski: Adopting the old under-the-desk phone-checking method after being too bold and sitting at the front of the lecture theatre. Still Moeen - I'd really fancy another pacer here. The sky is just turning blue, the Wanderers in enjoying increased sunshine. Like pagans at Stonehenge, the Barmies worship the sun, all trumpet and song. "AB de Villiers is uncertain, Steven Finn has made him uncertain. He knows he's got a fight on his hands." This track is a real snake pit. Every so often one rears its head to spit at the batsman. Finn gets a kicker to jam the handle of De Villiers. With the skipper hopping around, Finn flashes his maniacal smile. Shades of Curtly Ambrose. Sir Curtly, as we should call him now. Tom Girling: Bairstow on track for 10 dismissals... from 10 different bowlers?! Still the spin of Moeen. I know he's got the wicket, but would England be better off with pace at both ends? Du Plessis gets off the mark with an edge past slip, the defends to defy the three catchers lurking around the bat. "This will be interesting for AB de Villiers. He's just lost his second best batsman and he's seeing the ball is moving around. It could go either way now. Two more wickets for England and it's not looking too clever for him." South Africa have lost two wickets for 10 runs and are now up against it. Faf du Plessis joins AB de Villiers in a bid to stop the rot. Even the sun has come out to shine on England's resurgence. Looking again, that ball to get Amla really was a rozzer. It pitched on middle and moved away to square the batsman up. There wasn't a great deal that Amla could do - in fact, a lesser player might not have been good enough to edge it. "It was a fine piece of bowling and brilliant from Steven Finn, who has been the best England bowler today. England are all pretty pleased with themselves now." "That was a gorgeous delivery. He pitched it up, the ball left Amla and the batsman didn't transfer his weight forward well enough. Finn deserved that. This is a good moment for England." Got him! That's a beauty from Steven Finn, inducing an edge from Hashim Amla. Angled in on a full length, then just nipping away to catch the edge as Amla gets stuck on the crease. We said that one wicket might bring a couple and that has been the case. England have an opening. Michael Shaw: Ali gets a wicket with a ball that bounces and turns. Have SA missed a trick here with an all-seam attack? Moeen is round the wicket to this pair of right-handers. I can see how it improves the offie's chance of an lbw, but would bowling over not be the more attacking option? As if on cue, Moeen hits Amla on the pads and asks the question. A beardy appeal turned down. "That's three successive dismissals in the forties for Dean Elgar now." Removing Elgar is all well and good for England, but they're now faced with the Amla-De Villiers axis. The galloping Broad continues to hoop the ball into Amla's pads with James Taylor lurking at short leg. Good from Broad, but the shuffling Amla dead-bats from the crease. "That is a beautiful strike, and a great way to get off the mark." What is the knack that Moeen Ali has? It's like someone has dipped his arm in liquid gold. The seamers toil for an hour, then the spinner nips in. AB de Villiers, the new captain, is the new man, immediately dancing to belt down the ground for four. Game on. And again! This time over mid-wicket. Cavalier stuff from the skipper. "It turned, just enough. The bounce is above bail high and if you get a bit of movement it's just the same as having a lot of movement and no bounce. It was a beautiful delivery." There's the breakthrough! It's Moeen Ali, who gets one to rip away from Dean Elgar. Elgar fences at one that spits and bounces, getting a tiny tickle through to the big paws of Jonny Bairstow. England needed that and, on balance, probably deserve it. "England have done better since lunch - but it doesn't show in the score." "I can see two or three wickets here falling very quickly. Hashim Amla has been lucky." "England have kept control, and if they get two or three wickets they are very much back in the match." Broad is swinging the ball, but Amla, buoyed by runs and freed from the captaincy, looks to be batting with a blade as wide as a door. A lovely flow of the willow through the line, taking four through the covers. Only two slips now. England will be in the hunt if they can make a breakthrough, but where is that breakthrough coming from? "Anderson and Stokes have given everything after lunch and South Africa have sneaked through it. Now it's Finn and Broad, but it's going to get to the point soon where Cook is going to have to turn to Moeen." A double change for England (I always think a double bowling change is slightly unimaginative from the captain) as Steven Finn replaces Ben Stokes. Elgar punches off the back foot for three, but Finn the keeps Amla honest as some home fans chant in the crowd. South Africa are slowly grinding this out, making England do the hard yakka. I'm told that Stuart Broad was under the weather before the break, with the symptoms of the stomach bug that has gone through the players and media. He opens a new spell like a man feeling dicky, banging in a half-tracker than Elgar pulls for four. He improves, though, almost pinning Amla with a big in-ducker. Email Message: A few seasons ago we had a league match disrupted by rain. During the break in play one of our openers (who was still in) realised he had forgotten his phone charger. With the rain looking like it was set in for the afternoon he decided to drive home to pick it up. The minute he left the ground the rain stopped. Suddenly the umpires rang the bell and we were back on, with our opening bat nowhere to be seen! Think it went down as timed out. The man in question is a current first-class cricketer as well. A few seasons ago we had a league match disrupted by rain. During the break in play one of our openers (who was still in) realised he had forgotten his phone charger. With the rain looking like it was set in for the afternoon he decided to drive home to pick it up. The minute he left the ground the rain stopped. Suddenly the umpires rang the bell and we were back on, with our opening bat nowhere to be seen! Think it went down as timed out. The man in question is a current first-class cricketer as well. Stokes is into his 11th consecutive over, a spell that has straddled lunch. Three slips and a gully for Elgar, who must have spent plenty of time watching Graeme Smith bat. The crouched, shuffly, elbowy technique is an imitation of the former skipper. Good from Elgar, nudging and running to rotate the strike. "James Anderson looks more comfortable bowling at the right-handers, when he can use the outswinger. He has settled into a groove against Hashim Amla." Still Anderson, who is yet again wearing what I think is a tracker or heart-monitor under his shirt with straps that look like a sports bra. Side-parted hair, zinc on the cheeks, Anderson kicks in and tests Amla with the old in-in-out. Amla up to the task. It might be time for a change. "It's been a gritty performance from South Africa - they are really laying a platform." England have been unchanged since lunch, so, despite the increasing threat, there might not be too many more overs for Stokes and Anderson. Stokes comes round to Elgar as a drum bangs inside the Bullring. Some lift, a flash, a play and miss. "Great pressure," is the chirp. It might be, but there's nothing to show for it. Alex Herries: Should have thought of this before: 3 week old Rebecca finally dozed off to the dulcet tones of Blowers, Vaughany, et al. on TMS. Thanks chaps! Although she's crying now, presumably due to the lack of wickets. Perhaps a Twenty20 sort of girl? "Great work this Jim," is the chat from behind the stumps as Anderson forces Elgar into a tangled pull shot. He's just starting to feel it, Anderson, now beating Amla with one that shapes away. It's like when Stella got her groove back. Ooofff, Amla almost chops on. Anderson chunters. Good cricket. Jack Waldis: That's where the review system is seriously flawed. How can England lose a review when the ball is shown to be clattering middle. Mark Kelly: You can understand India's reluctancy to use technology when decisions like that are upheld as not out. There's steam coming out of Stokes' ears now. First ball after the review, Amla inside-edges past the stumps for four. Bowlers don't like the Chinese cut at the best of times, let alone when they feel aggrieved. He's pushing 90mph now, the Durham man. Wound up and bowling gas. "England will feel like nothing's going their way today. They've bowled so well after lunch but if they keep bowling like this, they will create other opportunities." Would you believe that? It's trimming the bails, but not taking enough wood to overturn the decision. Umpire's call. Ben Stokes is shaking his head as he stomps back to his mark. That's the curiosity of the DRS. If Amla had been given out, the batsman wouldn't have got that overturned either. Line looks good. Too high?